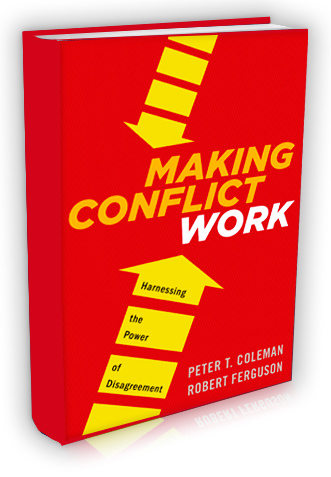 Last year around this time, my friend and business partner, Rob Ferguson, published his book Making Conflict Work: Harnessing the Power of Disagreement, along with co-author Peter T. Coleman. In honor of the book’s one year anniversary, we wanted to share with you the following excerpt. It’s about the pitfalls that can make workplace conflict resolution worse. 1. Treating all conflicts as the same. Our research has identified seven distinct conflict situations, depending on how cooperative or competitive the parties are, who has more or less power, and how much they need each other to achieve their goals. The seven situations are Compassionate Responsibility, Command and Control, Cooperative Dependence, Unhappy Tolerance, Independence, Partnership, and Enemy Territory. Each situation requires a different approach, and diagnosing the situation correctly leads to the most effective strategy.. Most leaders (and consultants) overlook the full significance of how power differences affect conflict. Whether you have more power than the other party, or less, it takes additional skills to get to the real issues and achieve your goals. If you have less power, you risk overstepping your bounds or inviting abuse. If you have more power, you risk eliciting dishonesty or sabotage from your supervisee. Ignoring power differences, and lacking a strategy for them, can render standard conflict resolution methods ineffective. 3. Abusing the power you have. Read any page of any history book and you see how monarchs, generals and presidents abuse power. But so do supervisors, middle managers, and team leads. You only need a little power to abuse it –– and thus make yourself less effective in conflict. Some of the most common power traps include: “The Bulletproof Trap” (you make conflicts worse by thinking you are invincible), the “Not-Seeing-the-Trees-for-the-Forest Trap” (you appear insensitive to your underlings by ignoring details because you only see the “big picture”), and the “Screw the Rules Trap” (you bend or break rules because after all, you’re special –– you’re the leader! This sets the stage for minor or major rebellions). 4. Neglecting the power you have. When you find yourself in lower power in a conflict, you may fall into different traps. These include the “Keep your Head Down Trap” (you keep your aspirations so low you don’t even try to find better solutions), the “Powerlessness Corrupts Trap” (you succumb to cynicism or rage toward those in authority, turning to apathy or sabotage), and the “Victim Status Trap” (you wallow in a sense of oppression and victimhood, which ironically can lead to a sense of superiority and refusal to negotiate). Don’t make conflict worse by acting passively. Even if you are less powerful than the person with whom you disagree, it doesn’t mean you have no power. Less power does not equal powerless. There are always informal ways to influence managers and leaders above you in the organization. And these methods do not show up on the org chart. They include actions such as appealing to the others’ interests, eliciting cooperation, creating positive relations with superiors, fostering reciprocity, rational persuasion, increasing their dependence on you, and more. I highly encourage you to go buy the book! Happy reading!